- Wheat Patch for picking grain. - Flax Patch for picking flax. - Stationary Sheep for easy wool. - Chicken Pen for low level training, or collecting feathers. - Mining Rocks 4 Clay, 4 Copper, 4 Tin, 4 Coal,4 Silver, 4 Gold, 4 Mithril, 4 Adamantite, 1 Runite. - Woodcutting Trees; 4 Oak, 4 Willow, 4 Maple, 4 Yew. - Item Spawns have also been added: Shears, Jug, Pot, Needle, Bucket, Hammer, Chisel, Tinderbox, Knife, cooking apple. Fixed staff names in chats and lists. added names to above players heads. toggles in setting bar. Same Client! but Added Frost dragons to "king of castle" to prevent ppl have millions of pk token in no time. Added Banker back to skill event island. Client 11A Released and is available for download. - Includes Fix for magic and prayer scroll bars. - ::Say in combat has been fixed. - ::rules has been added in game. - Added Dragon 2h, Plate and Spear to Master Certer in Herblaw Supplies. Equip Menu - Weldable items now transfer to the equip tab when you wear them. 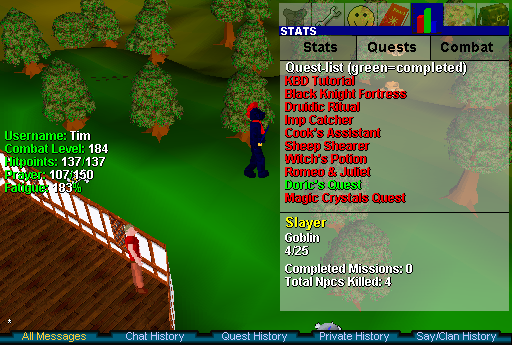 Slayer skill - There is no task master, to start the slayer skill, open your quests tab and hit start! New Event island: pre-made Skilling Event locations for most skills. Bronze-Rune values are restored to RSC. Requirements added to Ultimate Potions. You are able to smelt all ores at once for half exp. It also costs GP around high alch value of each bar produced this way. - Disconnect and client crashes fix. - King of the hill fix. 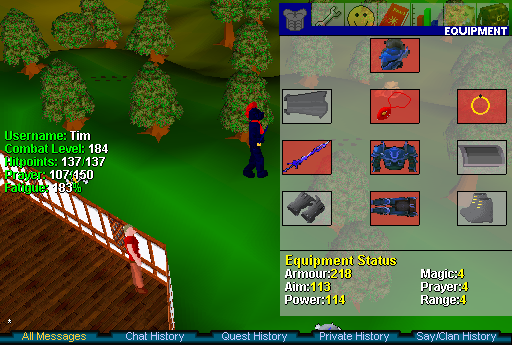 - Equipment Status within the stats bar has been moved to the combat tab. Staffs that have orbs in the inventory are now visible in hand(Fire Staff is a Red Orb). Gloves have been remade white so their colors show. Dragonhide and leather chest sprite has been replaced. AFK/Idle Timer has changed from 2 Hours to 1 Hour. Landscape added to West side of the map for future content. Requirements to enter still are the same. You can now Mix your used potions. 2 and 1 doses make a 3 dose etc. Added missing wilderness ladders, enabling new areas. This NPC has high attack, strength and defense, but Low Hits. Locations: Boss City, and Ranging Guild. Requires 120 Ranged to enter. There is a lever across from guthix lever. Zamorak and Portal room ladders fixed. New Max hit added for PVP from around 85 to around 66. You can still hit around 85 on Monsters. Kolodion now teleports you to Mage Arena for Godspells. Sprites for Boss XP Packs Updated. Income: 3600 PK tokens per hour spent as King of the Castle. ::enterking will skull you, and teleport you to the middle of castle. If you kill another player you get their 10m, armour and receive PK points for time spent as the king of the castle. Located in edgeville, the sub vendor accepts sub cards to make your account elite member, or to reduce a combat stat from level 60 or less, to 1. Spear shafts can be made with gum or twisted logs. You can't get str att def hits Xp. new city and island for Mega Bosses. WARNING: Bosses are extremely difficult to fight. Please note that they will hit you through your full Titanium armour and that you are not able to use Paralyze Monster against them. I suggest teaming up with some fellow players to try to take them on. Take turns fight the Boss while you use other accounts to range. The items in the shops are just our preliminary thoughts of what is best but the prices and items are subject to change. All bosses have the same combat stats and it is just the hits level that varies among them. If you have the time, don't be afraid to take on General Graardor. Higher options are better chances. All god items have had their value changed so that they are worth 1m gold in game. This will help with the issue of god items dropping when you die. Please note that this also affects the value of the Amulets. We have also removed the store in which you could buy amulets since you can obtain them through the token merchants. There are more updates to come in the next little bit. Stay tuned! Open to anyone who wants to kill it. Has a chance at dropping a dark red phat! Must be combat level 69 or below to enter Graveyard. Has a chance at dropping a dark red mask! Must be combat level 48 or below to enter fenced area. Has a chance at droping Rogues Purse Gloves or Boots (dark red)! God token Merchant for Guthix has been added and now they all wear the items that you can buy for tokens. Changes Master Fisher to give out cooked swordies to help with low level pking. Added a combat timer to Kardia so that she can no be used within 60 second of combat. Changed skill requirement for Ultimate Def pots to 144 and Ultimate Zamorak Potion to 148. Fixed gods so that they can not be afked with full titanium unless you use ultimate defense potions. Also fixed Bandos to make it equal to other gods. Located: North of Demonhiem, Landscape goes west from wilderness. Use Dragonhide with needle and thread to make Dragonhide body or chaps. Requires 3 Dragonhide per item. - New Runes: Dark Air, Dark Fire, Dark Earth and Dark Water runes. - Dark runes require high level runecrafting to make at a Ancient Enigma Altar. - Iban now requires 20 attack and 50 magic to equip. - Curses temporarily disabled until fully fixed. - Added Guthix and Bandos Ammy to Demonhiem Ammy shop. Axe and Picaxes bonus has been fixed. Exp to next level after 99 is fixed. Rings are now equipable with stats and have a rub command for teleporting. There is a 1 in 5 chance the ring will be deystroyed upon teleporting! The cloth then is to be used with needle and thread to create new magic armour. - Added drops for these monsters. - Added spawn locations for boss imps wonder whole world. - Added drops to new colored Imps. - Gnome Robes are now obtainable via Boss Imps. - Platinum Bar now requires 14 coal. Updated Crafting Wiki Page for all wieldable crafting items with stats. Doors and Gates have been added / fixed in most cities. Rune rocks to wilderness Deadly red spider mine. 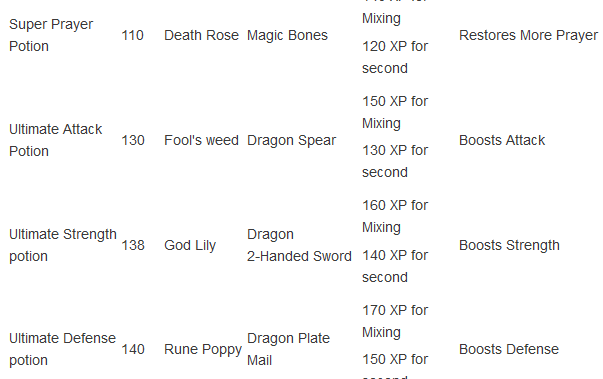 Rune and Dragon rocks added to God Dungeons. Mystic trees added to God Dungeons. Dragon rocks added to wilderness Shadow Spider/Fire Giant Dungeon. Jangerberries now spawn West of Yanille on the Ogre island, Tele-grab required. A passage to the south shore has been opened from Shilo Village / Island West. Goblins have been added in Edgeville Sewers before the magic lever. Today we are proud to announce that the new potions are finally out! -Super Prayer gives you 33 prayers points. Below are the requirements for making the potions they can be found on our wiki here. -More updates to the client. Client is now resizeable. (Beta on Medium and Large Clients) - Via Settings.ini in your client folder. New Cities: Demonhiem and Kantrana, located north of Taverly to Seers. ::advertise - Opens the advertise and referral rewards thread. ::skills username - Show the users skill. Remember to do _ if there is Space in the names like this: dr_strange. ::invite - Invites a player to your clan. ::accept - Accepts a clan invite from another player. ::clan - Shows who is in the clan. ::leave - Leaves the clan. Shop Buy/Sell Modifier has been changed. Added Ranks for Developer and Owner. Max hit before potions/prayer is ~50. Khorium is purple, Platinum is yellow, Titanium is blue. You will appear in Edgville when you die. When you super heat items the bubble icon above your head will show the exact bar. When you alch it will show the items you alch in the bubble icon. When you drink potions it will be shown in bubble icon above your head (will show exact potion and doses). High level ancient altars will now give double the xp and runes of normal Altars. Runes - Connector town west of Shantay Desert, North-East of Island. Addy Shop - North of Demonhiem Square near wilderness access. I love the mining and woodcut fix! Finally theres a point in using higher quality pickaxes! Mining and smithing is basically the only thing I do so im really happy with this change! For me as a smith, this should mean a bit lower price on coal. For non-smiths it will mean a bit lower prices on armor and weapons. I've noticed some of the new items include prayer bonuses. I'm just curious if the prayer bonus system is actually currently working, or does it still not affect drain rate? Osk wrote: I've noticed some of the new items include prayer bonuses. I'm just curious if the prayer bonus system is actually currently working, or does it still not affect drain rate? Nothing currenty affects prayer drain rate yet. This is something that will be worked on server side in the next little bit. New prayers will be coming out and the drain rate will be fixed with that release. Just posting this in the off chance that anyone else runs into the same error..
Just a quick question. Do the new rings work with plate armour? Or chain only? Thanks in advance to anybody with an answer. qqqwww wrote: Just a quick question. Do the new rings work with plate armour? Or chain only? Thanks in advance to anybody with an answer. They work with both, and can also be worn with gloves/gaunts if utilizing a chain. i cant find a post about it... but what are the spawn times on imps? delanski wrote: i cant find a post about it... but what are the spawn times on imps? Prayer Drain Rate is now fixed for robes and other prayer point. Can you please double check this for monks robes, or tell me what I'm doing wrong, because I was not noticing a difference between pray drain with monks robes and without them. I also timed it and there is less than a 1 second difference in drain rate when wearing monks robes as opposed to not wearing them (I'll attribute that second to human error, rather than actual drain rate difference). I will double check the coding to see if there is anything I can change. But for now I think if you make sure you have the monks robes on before turning on your prayer, you will notice a difference. I know I have tested it multiple times and it makes a significant difference the more prayer points you have. I myself have been using priest robes, and they work exceptionally well. The pray drain has most definitely been fixed..
Topic has been updated at the top. I don't think smithing is yet. Maybe first in next updates. Mod B wrote: I don't think smithing is yet. Maybe first in next updates. It is, that's why I accidentally made 6 large helmets when I only wanted to make one.. Leveling smithing will be a lot faster with this in now, but smithing items for sale will be slower. New Max hit added for PVP only, From around 85 to around 66. Added a fix that will reduce disconnect and client crashes. Equipment Status within the stats bar has been moved to the combat tab. went to go do some alching on the 11.99 client, and I cant scroll down in the spell menu, hope you guys can fix this. Includes Fix for magic and prayer scroll bars. brwn wrote: Client 11A Released and is available for download. Works now. When is ranging gonna be fixed?